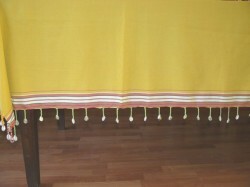 Our tableclothes are made out of the original kikoy-material from Kenya. 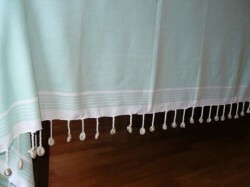 Some tableclothes haveThe shells at the borders make them look extra special. The natural and decorative materials, like cotton and real fresh-water shells, give your interior, garden or balcony a warm and natural atmosphere. 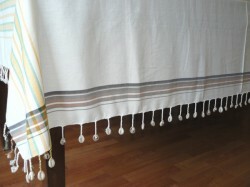 The shells make the tablecloths heavy and they prevent the wind to blow it away from your table. In Nairobi (Kenya) the KikoyShop runs a workshop where a few women make the products on our demand. The tableclothes with shells are made in this workshop. The work is very intensive. To start they remove a number of dreads at the borders of the kikoy and twist them into fringes. After that they attach a shell at the fringe. They finish with a knot. This work is done all by hand. An experienced woman makes 1 big tablecloth per day. In Kenya work is difficult to find and every time we ask the women to make our kikoyproducts they are very happy with the job. The KikoyShop gives the woman their payment directly, without any other party interfering. The kikoyfabric is 100% cotton. It can be cleaned in the waschingmachine on 30/40 degrees. No loss of colour, no shrink. Drying in de tumble drier is no problem. For the tableclothes with shells: to protect the shells and your machines we advise to put the tableclothes in a net or cushioncover. 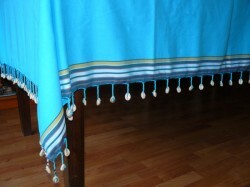 More tablecloths can be found at the product group kikoy-tablecloth XL.